The Quikscribe Player makes digital transcription quick and easy, taking, taking full advantage of the unparalleled features of the Quikscribe Recorder. The Quikscribe Player's digital transcription interface is controlled via an external triple action Foot Switch and global Hot-keys. Digital transcription is a snap since the Quikscribe Player can work independently, or as part of a work-group, whereby multiple typist work from a central typing queue. 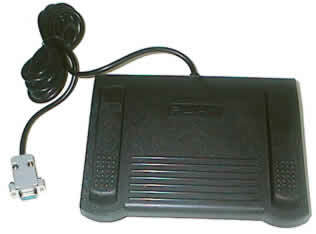 The Quikscribe Player uses a heavy duty, triple action Foot Switch. It can Play, Stop, Rewind and Fast Forward. You can also vary the Back Space distance for the Foot Switch and you can vary the Seek Speed (Rewind and Fast Forward rate). The Quikscribe Player also has global Hot-keys, which means you can control certain actions of the Quikscribe Player while working within other programs e.g. Microsoft Word or Word Perfect. The Hot-keys are user definable, which means if you ever encounter a conflict with other programs, you can easily change the associated Hot-keys to resolve the conflict.